A few weeks after the Winter Cup, the five players of the Generation of Miracles as well as Kuroko have settled back into everyday life. But an invitation from Momoi arrives, proposing that the former Teikou Junior High players gather once again and play a game. Kuroko happily accepts the unexpected invitation. But Kagami is bothered when he learns about the game, because on that day, the Seirin High team was planning a birthday party for Kuroko! However, Kagami tells Kuroko that the birthday party won't be until the evening, which makes him glad. So on January 31st, Kuroko's best day begins! This OVA is the absolute best kind of fan service. The kind that makes you smile, laugh and feel all fuzzy inside. This is the kind of fan service that we need to see more of in anime. The story is simply there for the sake of fan service but I'm alright with that. It was extremely satisfying seeing the generation of miracles back together after all of the tension they all had in the original series. The characters are still amazing and seeing how the result of their transformation all of their characters went through in the original series made me appreciate the series as a whole even more. All of the characters interaction in this episode was the true star in this OVA. Seeing all of the old Teiko members without the tension shown in the original series was so satisfying to see and is something that I really cannot get enough of. The animation is decent. It wasn't mind blowing and it didn't need to be. The art and character designs are as still as good as ever. If you have seen the original series you know what to expect. I don't think I have ever enjoyed an OVA before and I don't think I'll find one this enjoyable in a long time. This is an absolute must for anyone who enjoyed the original series. This TV special for one of my favorite shows of all time made me feel really good and it made me miss KnB even more then I already did. The story here is quite basic, basically Kuroko reunites with the generation of miracles on his birthday and they all celebrate after. The characters are all still as like able as ever with their own personalities and quirks. The art isn't as great as the main series but it's still very solid animation and art. The voice acting had no notable flaws and were very enjoyable to listen to. Overall I enjoyed this Special very much and if you are a fan of KnB you have no excuse to not watch this. This was a great Christmas gift from one of my favorite shows ever. This is a special, something beyond the main story, and as such it must be viewed. There are not revelations, no secrets, no nothing. Just pure enjoyment. If you can watch it like that, it's almost impossible not to like it. The story itself is quite simple and you don't have to be a veteran anime viewer to predict how it's going to end, but again, it's rather how i'ts told than what's told that meke the special so enjoyable. Same art as the main series, which is quite good, there are some nice details and there's no abuse of CGI for the street basketball game. Easy to watch. Again, it doesn't go or try to go away from the main series, GRANRODEO gives KnB a nice touch; the voices are the same, which are quite good, and the BGM helps and goes well with the story. Kuroko, Kagami, Aomine, etc. They are the same of the anime, but changed after all that's happened, and the change is well shown, the are no strange things. Pure enjoyment. A special to watch, enjoy and go out for a buguer after it. It will probably leave you with a smile, and that's great in every way. I'd highly reccomend the Saikou no Present Desu to any KnB fan or viewer who has finished the anime. If you're a KNB fan you will surely love this OVA. A must-watch indeed. This OVA takes place after KnB Season 3. So basically, days after the last fight with Rakuzan. The OVA has its Fan-Service Air around it which basically makes every KnB Fan (such as myself) to lose their mind while watching. So this OVA has the Kiseki no Sedai ( GoM) gathered and play basketball. And also it's Kuroko's Birthday! which makes this OVA more interesting. All the characters, GoM, Seirin and others had their share of moments in the OVA even if its only a 24-minute clip. 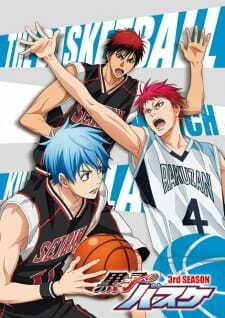 This OVA is a must-watch for every KnB fans. I recommend you watch it now. Its light-hearted and gives you the feeling of missing KnB all over again. Anime Birthdays: Which Characters Share Your Birthday? Celebrating anime birthdays is the perfect way to cross the boundary between reality and fiction. But what about your special day? How wonderful would it be if you could celebrate your birthday with a lovely character who shares it? Come meet your anime soulmate!